Last month I picked up a tin of Saponificio Varensino Flying Mango Beta 4.3 and it's quickly become one of my favorite soaps. I tried one of the SV soaps several years ago and don't remember being impressed, but Flying Mango is a truly great soap and I have more SV soaps inbound. I hope all of the Beta 4.3 versions have as much slickness and cushion as Flying Mango. So... How are the SV after shaves? I can only speak for the Asylum Colonia by SV but I found it to be truly special. The skin care properties kept me feeling smooth and hydrated all day. I am looking forward to using it again. (02-03-2019, 03:58 PM)Sully Wrote: Last month I picked up a tin of Saponificio Varensino Flying Mango Beta 4.3 and it's quickly become one of my favorite soaps. I tried one of the SV soaps several years ago and don't remember being impressed, but Flying Mango is a truly great soap and I have more SV soaps inbound. Not loved by everyone but my skin enjoys them. I pair the 70th aftershave with the Flying Mango soap. My favorite after shaves are Manna di Sicilia and Tundra Artica for their face feel. Very softening to my skin. The Flying Mango is great, but my favorite SV soap is the Fern. One of the best scents out there IMHO. Flying Mango is a decent performer for me and has piqued my interest in other offerings from the brand. I am quite confused which one to pick for myself. Opuntia, Cosmo or any other scent? (02-05-2019, 04:28 AM)Jags009 Wrote: Flying Mango is a decent performer for me and has piqued my interest in other offerings from the brand. I would say read the scent descriptions and pick one that sounds like something you will enjoy. I have Flying Mango, and Aromatic Fern. I prefer the scent of Flying Mango. Fern is nice but I'm not a big fan of fern scents. Let us know your thoughts on these 2. Will do Jagdeep. The Colonia arrived today along with the matching aftershave and I can tell you the soap smells amazing! Colonia is on deck for tomorrow's shave. I received my Colonia soap and aftershave set yesterday and I have tried it this morning. A friend of mine have the 70th set and he told me something he was able to do because the residual slickness is so much great. I decided to try it this morning to see if it really lived up to what he told me. So, i decided after my first pass to just add a bit of water to my face to do the second pass and use only the residual slickness, and it worked. That soap is really slick. I will for sure try other scent in the near futur. Speaking of scent, the scent in Colonia is usually not my type of scent, but this one got me instantly right when I opened the box. Awesome one! I usually don't take the same soap two consecutive day, but guess which one I'll take tomorrow morning!!! I've shaved with Colonia soap three times and used the AS twice. Scent: It's really nice, it's very similar to a NOS puck of Pen's Blenheim Bouquet, it's a little more citrusy but very similar. The AS is fantastic and to my nose is a perfect match to the soap. Lather: This soap can hold a lot of water, and it has a wide working range. The lather works well from very thick to almost over hydrated and drippy. For me it works better on the thick side, not clog your razor thick. Slickness: This is where this soap really shines. It's amazingly slick, one of the slickest soaps I've ever used. Residual slickness is fantastic. Cushion: Cushion is on par with my favorite soaps. Post shave skin care: This is also a home run. I could skip using after shave the post shave skin care is so good. Some other soaps that I've used that also have great post shave skin care have left my face feeling greasy, not so with Colonia. My skin feels nicely hydrated and moisturized. Overall both Colonia and Flying Mango (both versions 4.3) are really outstanding shaving soaps and they have become two of my favorite soaps. Opuntia is scheduled to be here tomorrow, I hope it smells as good as the other two soaps, it's also version 4.3 so I'm sure it will have the same performance as the other two. Excellent review Shawn. Concise and informative. (02-10-2019, 04:08 PM)Sully Wrote: I've shaved with Colonia soap three times and used the AS twice. Wow, awesome review. Having never had the pleasure of trying Blenheim Bouquet, I'm really pleased that you say it's similar. Great write up Sully. I am sure you will find Opuntia to be unique enough to have some differences in facefeel. Are you liking the aftershaves compared to what you normally use? (02-10-2019, 04:47 PM)TheLegalRazor Wrote: Excellent review Shawn. Concise and informative. Thanks Ricardo. It's a shame it took me so long to try Flying Mango. The scent is similar. Remember I'm comparing it to the soap, not the cologne or aftershave. It's a little sharper, and heavier on the citrus notes, but it immediately reminded me of BB. (02-10-2019, 05:10 PM)zaclikestoshave Wrote: Great write up Sully. I am sure you will find Opuntia to be unique enough to have some differences in facefeel. Are you liking the aftershaves compared to what you normally use? The aftershave is great. I don't normally use or need a moisturizing or hydrating aftershave. I'll continue to use Colonia AS because it isn't heavy or greasy, it's very nice. Most days I use Myrsol or Aqua Velva Musk. I ordered the Colonia with the black aluminum container from BullGoose. Container is awesome, will last several lifetimes. The soap's scent initially smelled like an old lady's perfume to me. After a while, it started growing on me and I started to like it. When I lathered up and started shaving, the lather on my face smelled better than the scent fromm the puck in the container. Performance is top notch. Very easy to whip up thick lather, great cushion and slickness. Post shave was suprisingly close to Nuavia. I have tried 5 SV soaps and the Colonia and Flying Mango are the best performers IMHO. Cosmo and Manna sicilia are my favourites for the shaves they give. However, I also love the colour shades the soaps are, black Dolomiti attracts me for instance , more than their scents! I like their soaps a lot, especially the new 4.3 version of the Colonia. I had the 4.1 version which was also good, but 4.3 is slicker and not as drying. I am not a big fan of the aftershaves as they are almost a balm and I prefer splashes. I hear that the SV brushes are also excellent. I recently picked up a bar of Tundra Artica (4.1), haven't tried it yet, but i hear almost no chatter about that scent.. why is that? can't wait to give it a go. (02-21-2019, 10:54 AM)Puma Wrote: I like their soaps a lot, especially the new 4.3 version of the Colonia. I had the 4.1 version which was also good, but 4.3 is slicker and not as drying. I am not a big fan of the aftershaves as they are almost a balm and I prefer splashes. I hear that the SV brushes are also excellent. The brushes are dense, but not overly so and set at a loft that allows for copious flow-through with very soft face-feel. 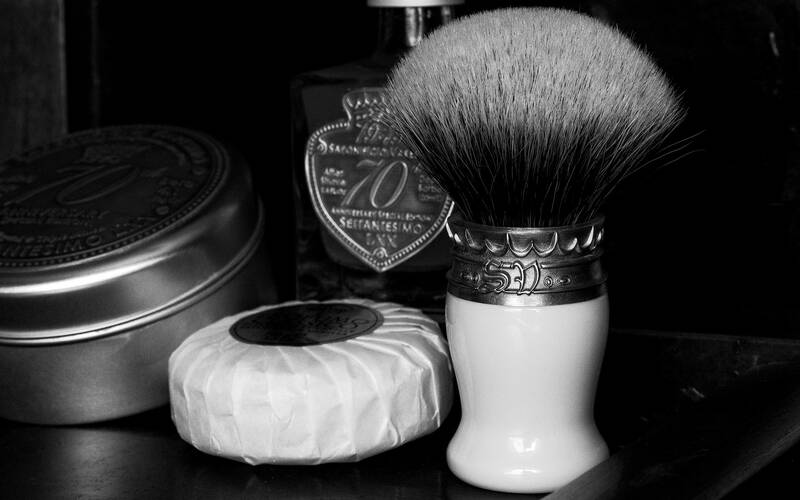 I’ve been shaving with my SV 2.0 brush, 70th soap & aftershave all week - and it’s been pure class.